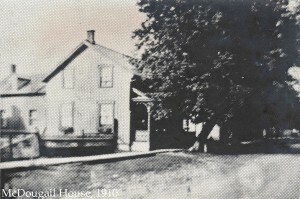 The MacDougall (McDougall) family lived on this property from 1862 until 1928. Duncan MacDougall was a wagon maker and blacksmith. His property was originally 2 acres in size; it included the house, a woodworking shop, a hen house, stable, open drive shed, extensive gardens and pasture. In 1928, his daughters sold the property to R.H. (Harold) Moore whose sisters lived here for many years. Mr. Moore was a merchant (1923-1948), businessman and also Reeve from 1947-1949. The property was originally deeded in 1845 to Alex Taggart, and sold March 31, 1862 to Duncan McDougall by Archibald Torney and his mother Isabelle Torney, for the sum of 60 pounds. Duncan MacDougall (1838-1922) purchased this property when he was 24 years old; he and his wife, Harriette (Hill), had 9 children. Our knowledge of the MacDougall property comes from a description written for the Goulbourn Township Historical Society by Mr. MacDougall’s granddaughter, the late Elizabeth Gordon. The property was originally more than 2 acres, running from McBean St. to Lennox St. The house faces McBean St.
To the north of the house and set back from the street was a two-storey brick woodworking shop where Duncan plied his trades: wagon maker, blacksmith and wheel right. He manufactured cutters, buggies, as well as light and heavy wagons. The wagons were made on the first floor, raised up to the second storey by an elevator with ropes and pulleys, and then painted. This shop no longer exists. Like most village homes, the MacDougall’s had a hen house and stables. These buildings were behind the shop, as were pastures. To the south of the house was a 3 bay open drive shed for vehicles and/or visiting teams of horses. The yard was treated with coal ashes until it resembled a tarmac. Behind the open sheds were vegetable gardens. On the south side of the house were flower gardens and the well was next to the street. Duncan MacDougall’s business did well in the 1860’s and early 1870’s at a time when the village was visited by several hundred teams a year ferrying men and supplies to and from the St. Lawrence to the Ottawa River lumber camps. Note that in this advertisement as well as on the MacDougall headstone in St. John’s Anglican Cemetery and some legal documents, the family name is spelled McDougall. Miss Gordon in her notes mentioned that the name was spelled both MacDougall and McDougall until about 1890 after which it was usually spelled MacDougall. As were other wagonmakers in the village, Mr. MacDougall was at times listed as an undertaker and served as a school trustee in 1875. Harriette died in 1885, and by 1901 Duncan was living in his house with his six unmarried daughters. In 1928, the daughters of Duncan MacDougall sold the property to R.H. (Harold) Moore. Constructed in the mid nineteenth century of board and batten, the MacDougall house was built in the classical revival style, demonstrated by the pillars added to the side of the door and the rectangular transom. Like the George Brown Store/Bank Building, the MacDougall house had an ogee window with its pointed arch. Goulbourn Township Historical Society Files. Located in Richmond Branch OPL. Neville, George and Iris. St. John’s Anglican Cemetery. Ottawa: 1975, Ottawa Branch, Ontario Genealogical Society. This entry was posted in Locations and tagged House, Industry. Bookmark the permalink.